Vince Jordan, an advocate for broadband competition in Longmont, Colorado, wrote the following op-ed for the local paper about the upcoming referendum 2A. He has given us permission to reprint it here. “There you go again” (to quote President Ronald Regan). Citizens of Longmont, from 1997 to 2005, we had the right to use the asset that the city owns, namely the fiber network, to the benefit of ALL of the businesses and citizens of Longmont. The same corporations that are trying to “buy” your vote again, as they successfully did in 2009 with their “No Blank Check” campaign, in 2005 were able to lobby for and buy a law that took away our right to fully utilize this city owned asset. What ballot issue 2A is asking is for the citizens of Longmont to take back a right they once had. 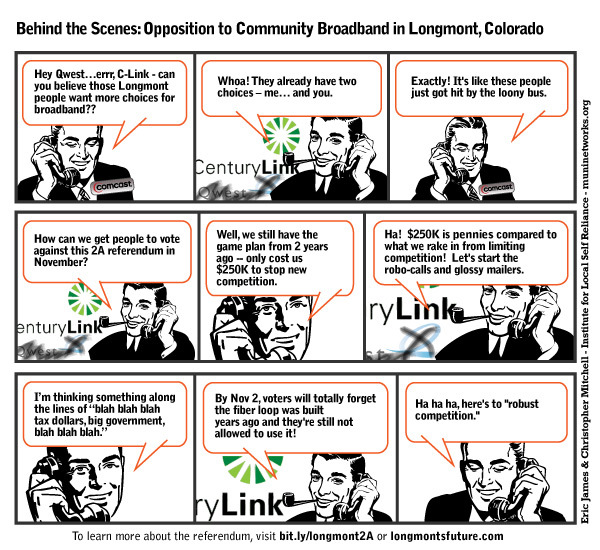 Residents in Longmont, Colorado are preparing for a municipal referendum to utilize an existing fiber optic network. The referendum is set for Tuesday, November 1, 2011. At issue is how the city can use a ring of fiber-optic cables it built around the city in the late 90's as part of its electrical infrastructure. Much of the capacity on the ring remains unused but the city requires approval of the voters in a referendum before it can offer services to local businesses -- which will encourage economic development by creating more telecommunications choices in the community for businesses and residents (some background here). Ballot Question 2A: Without increasing taxes, shall the citizens of the City of Longmont, Colorado, re-establish their City's right to provide all services restricted since 2005 by Title 29, article 27 of the Colorado Revised Statutes, described as "advanced services," "telecommunications services" and "cable television services," including any new and improved high bandwidth services based on future technologies, utilizing community owned infrastructure including but not limited to the existing fiber optic network, either directly or indirectly with public or private sector partners, to potential subscribers that may include telecommunications service providers, residential or commercial users within the City and the service area of the City's electric utility enterprise? Big cable and telco operators have wasted no time in spreading fear and false information to scare voters into voting against using a valuable asset owned by the community. When the community organized a debate for the end of September, the only people willing to defend Comcast's position came from far outside the community to do it. Trying to get in the mind of the big incumbents of Longmont, we developed this cartoon (the style is an homage to the "Get Your War On" comic). Download a higher quality pdf version. As AT&T tries to buy out its competition via the T-Mobile merger, it has sent out its allies and minions to push the company line in communities around the country. Here are two events in Minnesota and Wisconsin you should be aware of. On Monday, October 3rd, the Humphrey School of Public Affairs at the University of Minnesota is going to host a debate between Amalia Deloney (MAG-Net Coordinator and friend of MuniNetworks.org) and Former Congressman Rick Boucher on the subject of AT&T's attempt to buy T-Mobile (which just happens to be the low cost provider in the wireless space). A few short years ago, one would have expected Rick Boucher to champion opposition to this anti-competitive merger, but alas, the good citizens of his district rewarded his many years of hard work in Congress by voting for his opponent in the last election. As one often expects to see in DC, Rick took a new job and now works for a law firm with AT&T as a client. Suddenly Rick Boucher is the Honorary Chairman of the "Internet Innovation Alliance," a group that has a name that sounds like he should head it. But the IIA is little more than a puppet for AT&T and like interests. They use it as part of their astroturf campaigns to further AT&T's agenda -- ensuring that most Americans are stuck using a network designed for AT&T's interests rather than the public interest. We wish Amalia the best in the debate. This is a far better program than the last time AT&T came to the U's Public Policy school, which featured a blatantly one-sided program attacking inter-carrier compensation rules that have been essential for supporting rural network investment. If you want to attend, you should RSVP to the Center for Science and Technology Public Policy. It will be at 2:00 in the Wilkins Room. Unfortunately, I have a prior appointment and cannot attend. Colorado requires a referendum before a local government can build a broadband network as a result of a 2005 law pushed by Qwest to prevent communities from building next-generation networks. So when Longmont wanted to expand its fiber ring to offer residential and business services, they put it to a vote. They lost with only 44% supporting the measure. But now, more people understand the issue and the community is considering voting again. We saw the same dynamic in Windom, Minnesota. Almost ten years ago, Windom held a vote to build a muni FTTH network and it failed to gain the Minnesota-required 65% supermajority. After the vote, a number of people wanted to revote because they realized they had been conned by the incumbent phone provider (ahem… Qwest) and only truly understood the issue after the vote had occurred. City officials wanted no part of another referendum but community champions eventually prevailed and they had a second vote that authorized the community to build the network. The cable and phone companies created an astroturf group called "No Blank Check" that then used standard fear, uncertainty, and doubt tactics to spread misinformation around the community. A quarter of a million dollars is a drop in the bucket to stop the only real threat of competition these companies face anymore -- locally owned community networks. Access Wisconsin, a group of telephone providers working with AT&T to kill a network essential for schools and libraries across the state, claims that using taxpayer money is unfair competition. It is a fascinating argument from a collection of companies that rakes in various state and federal subsidies. "This is by far the greatest assault we've ever felt from the University of Wisconsin Extension," said Mark Weller, president and CEO of Access Wisconsin, which represents 30 mostly small, rural telecommunications providers. "It's totally inappropriate. "When services are available through the private sector at a competitive rate and we have to compete against yet another entity that is being funded by the taxpayers, that's just not fair." Those statements came after increasing outrage around the state following the news that their lobbyists waited until the 11th hour to suddenly insert a provision into an omnibus bill that would kill WiscNet and require the state to return multiple broadband stimulus awards expanding telecommunications services in unserved areas. But back in February of 2010, when Access Wisconsin was receiving a similar broadband stimulus award, it had a different attitude. The new fiber optic broadband connections will provide new education and economic opportunities in 380 largely rural communities across Wisconsin. Schools and libraries in those communities will gain dramatically expanded telecommunications access, while the installation of new infrastructure will help make broadband access available for businesses and residents. There are many places to find information about AT&T's war on WiscNet, a great credit to those who recognize the importance of WiscNet to schools, libraries, and local governments around the state. The best article on the subject may be from Wisconsin Tech News (WTN), with "UW faces return of $37M for broadband expansion in 11th hour bill." This post builds on that as a primer for those interested in the controversy. Update: Read a Fact Check Memo [pdf] from the University of Wisconsin Extension Service with responses to false allegations from AT&T and its allies. One of features that differentiates WiscNet from a private broadband provider is allowing for “bursting,” so that during isolated periods when researchers send huge data sets, they greatly exceed the average data cap. UW-Madison currently uses seven gigabits on average, and would have to procure 14 gigabits under the new legislation, even though most of the extra seven gigabits would seldom be in use, Meachen [UW CIO] said. A private network would not have the necessary capacity for scientists on the UW-Madison campus, who are some of the leading researchers on next generation Internet. A previous recommendation to combine BadgerNet and WiscNet was deemed infeasible, as AT&T would own the network and would not be able to provide sufficient bandwidth at an affordable cost, Meachen said. It will come as no surprise to those familiar with this space that the leading critic of MI-Connection, a cable network in North Carolina owned by local governments, has been revealed to be an employee of Time Warner Cable. Hat tip to Stop the Cap! for bringing it to our attention last night. We have long watched massive cable/phone companies flood public meetings (both honestly and surreptitiously) with their employees to give the perception of widespread opposition to a publicly owned network. So while this is nothing new, the practice must be highlighted as something community networks should be aware of -- much like the rampant abuse of the commenting system in the Salisbury Post, where any story that mentions the community fiber network Fibrant is slammed by a few people who post under many different identities to give the impression of widespread disapproval. Venzon [Chairman of Board for MI-Connection] said he’s frustrated because the publicly owned company still fights an image problem. “With the improvements we made to the system, I thought that people would be lined up out the door,” Venzon said. “I thought they’d see this as ours, this is us, and it just bugs me that we get such poor PR out there. We have not won that battle. And now we know that a major critic of the network works for Time Warner Cable, a company vociferously opposes muni networks as a threat to their de facto monopoly. It would not be as much of a story though if he hadn't denied his employment with TWC for so long in order for his attacks on the publicly owned network to be more effective.